I have 2 images. One is bigger and one is smaller. I want to blend the smaller image into the bigger one giving the impression that its actually on it. In photoshop this can be done with the displace filter. So, i want the pixels to move based on the brightness. Can anyone tell me how to achive that either using the unix command line or as php module. Last edited by suciuvlad on 2010-08-26T23:06:23-07:00, edited 1 time in total. I will look into it as I get time in the next day or two. I will have to see what PS is doing. But you can do something very simple, by distorting the produce.jpg image using -distort barrel, for example and make it look somewhat like it looks on the shirt. Then just composite it over the shirt. IM -distort barrel was a redesign of my script pincushion that has quite a few examples that you can see from my script web site linked below. Note however, that the coefficient ordering is reversed between my script and the IM function and the IM function has fewer coefficients. But at least you will see what a simple distortion can do. I just don't know (and may not know) exactly what PS is doing to get the displacement coordinates, unless it is just using the graylevel of the shirt for offsets. But I don't know if this is really what they do, nor just yet how to do that in IM with -displace, though I suspect something similar can be done. It has been a while since I last used IM -displace. You can experiment. 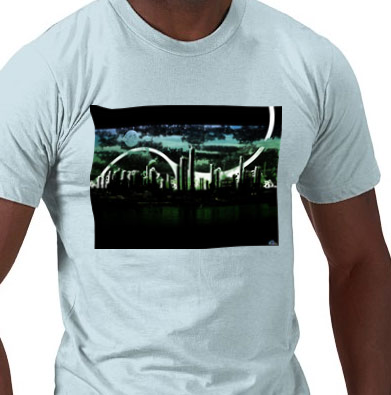 Crop out a section of the shirt that is the same size as the product.jpg and in about the area you want. Then use the IM displace to distort it with that section of the image. Then overlay the result back in the area you want. But this requires a displacement map. So where did you get the displacement map in your example. Or was it done otherwise. In any case what are your exact PS steps that you used to make your displaced example? Last edited by fmw42 on 2010-08-25T19:24:36-07:00, edited 1 time in total. See my post above. But here is a rough go at it. 2) Used the cropped, grayscale image as the displacement map to warp the picture. Note the negative arguments. I could have negated the displacement map instead. Note also that the stretch to full dynamic range is needed so that some parts get positive shifts and some parts get negative shifts. It does not reproduce your example, because I don't have your exact displacement map. But it gives you the idea how to go about it. You can play with the amount of smoothing or some other displacement map and the amount of displacement to apply and its direction (sign). 3) composite the displaced image over the shirt. Lots of ways to approach this problem! Last edited by fmw42 on 2011-03-04T20:50:39-07:00, edited 2 times in total. You may also like to 'dirty' the image slightly before overlaying. 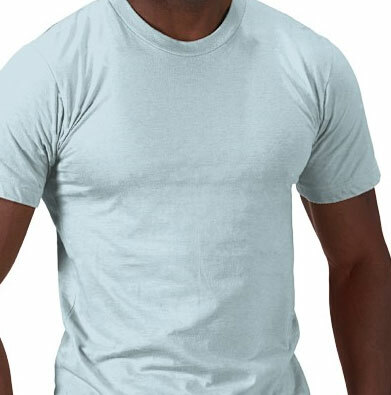 'white t-shirt' image and adjusting appropriately. I talk about this in IM examples, image displacements, but I have not done a complete job in the examples, mostly due to lack of examples. but the idea is essentially the same. and the shading part will definably be the same. If you can provide the displacement and shading map, then I can add a practical the example to IM examples. Please note you may need two displacement maps to do a good job. One X displacement one Y displacement. One way of generating these is using 'Shepards Distortion', and smoothing the result slightly. Thanks guys. You've been great. @fmw42: I'll use the first solution but instead of resizing the tshirt to match the size of the product i will use as displacement map the part of the design where the product will be. That way the highlights and shadows will be correct. I can't use the last solution(with the arc) because the model will be photographed from multiple angles. suciuvlad wrote: Thanks guys. You've been great. In the first two methods, I did not resize the tshirt to the size of the product. I cropped out a section of the tshirt of the size of the product image and put the result back in the same place as the cropped section of the tshirt. You still have not identified how you processed this in PS, nor where you got the displacement map to use in PS. So we are all still in the dark about that and cannot even try to reproduce that result.